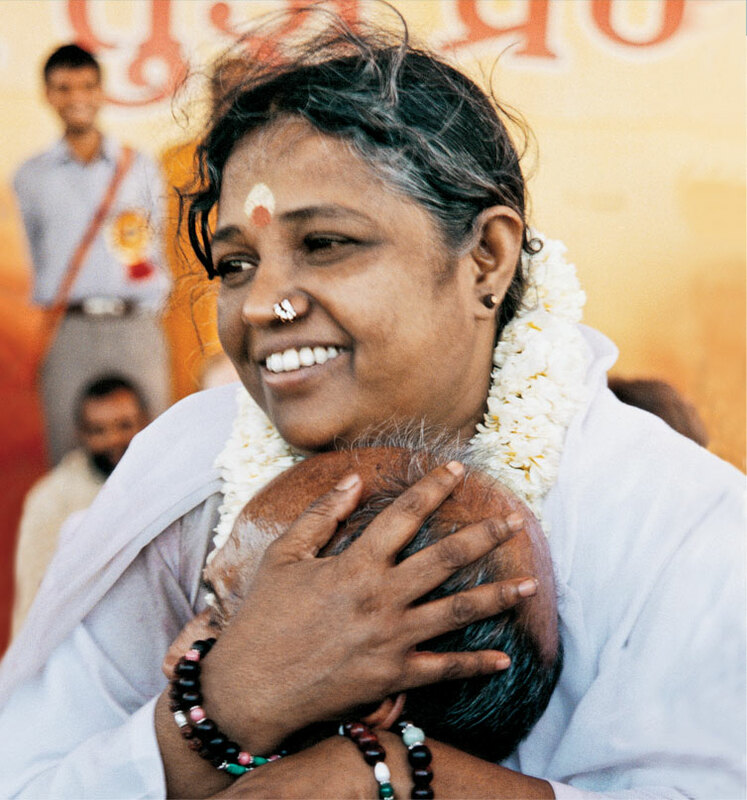 May 2014 – Girl Who Would be KING on Life, Style and INSPIRATION. Maya Angelou’s inspirational words were full of strength and have resonated with her audiences for years. The poet, author, and civil rights activist — who died Wednesday at the age of 86 — had a way of saying the simplest of things in the most eloquent of ways. 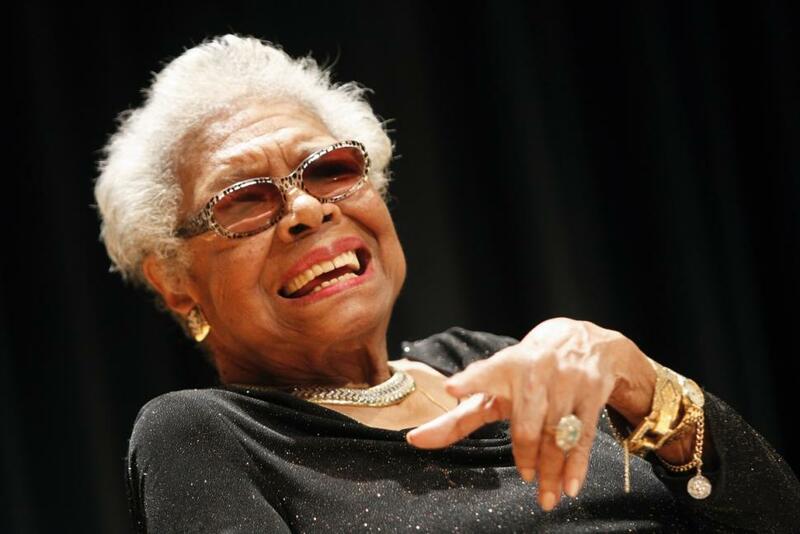 Her first autobiography I Know Why the Caged Bird Sings, published in 1969, resulted in international recognition and led to six more autobiographies and a number of poetry anthologies. 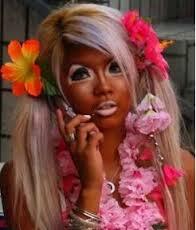 Personally…I don’t want to become a TANorexic! Summer is just around the corner (it started earlier than usual in Vancouver) and some of us are feeling that we look a tad too pale. What’s a white girl to do? Fake it, of course – what else? 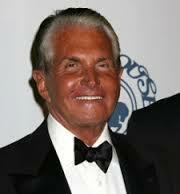 Start to shake up the St. Tropez self-tanning mousse and start slathering. Then somebody you know happens to comment that you’re looking really tan. You say “thank you” and they say “no, I mean like reeaally tanned” and then you’re feeling not so sure that it’s a nice compliment – like you overdid it with the bottle. You try to cut back but it is really difficult especially once you start to see results (George Hamilton comes to mind). You must repeat this on a daily basis until you obtain the color you want (which is the “perfect” fake tan) but the lines become blurred because you never can tell if you’re tan enough. It’s a tough circle. A Tanorexic is similar to an Anorexic in the sense that the person isn’t aware of how “tan” they really are, even if another person tells them they are. Is there a 12-step program to deal with this? Tanning addiction (see photos below for poor examples) is a rare syndrome where an individual appears to have a physical or psychological addiction to sunbathing or the use of tanning beds and/or spray tans – usually resulting in an overly orange or dark complexion and body color. This may or may not include a strange scented body odor although now you can find some sprays/lotions that don’t smell too bad (stop that!). Come on….who else is guilty? It doesn’t really have to be this way! Beauty biz – does Boots #7 live up to all the hype? Remember when the original Protect and Perfect was hailed as the next anti aging breakthrough in Great Britain? When it hit the shelves in the United States it sold out in days. In a recent Boots No7 review, BBC reported a clinical study that showed Boots No. 7′s Protect & Perfect to be as almost as effective as prescription products. Wow, big claim! Is it true? Gwyneth Paltrow says she is a user of Boots No7 skin cream which adds further credibility to the line. (After all, she should know). In 2011, Multiple Boots No7 Products Receive Good Housekeeping’s First Annual Anti-Aging Awards. Boots No7 has been featured and reviewed by a bunch of influential magazines. NBC claimed the serum was scientifically proven to repair collagen. 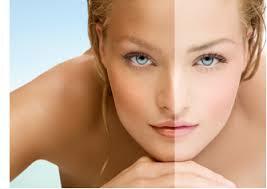 The primary ingredient that is known to repair collagen is oligopeptide. But is this ingredient in a high enough dosage to repair collagen? Our first reaction is that Boots No7 represents good value for money. When you compare Boots No7 to premium products, the formula is actually quite effective. The concentration of oligopeptide is reasonable for the cost of the product and we feel it represents good value for money. The Dermatology Review. No7 Protect & Perfect Intense Beauty Serum has been tested like no other cosmetic anti aging product in an independent 12 month trial. The findings clearly show that it has genuine, long term anti aging benefits. 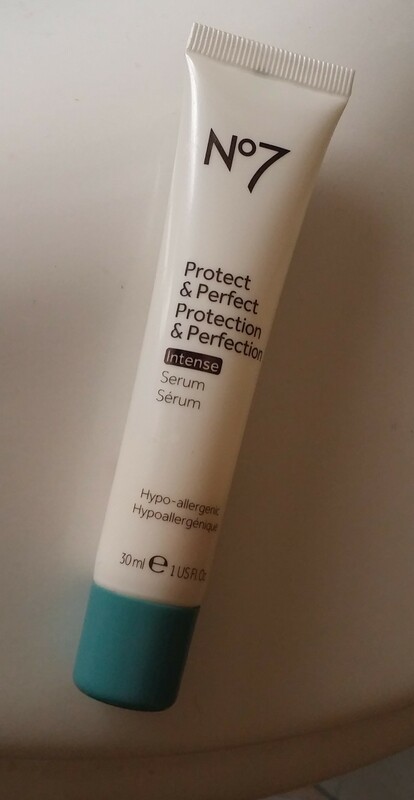 Contains Pro Retinol (I will blog about the importance of Retinol in my next post), concentrated levels of Boots unique antioxidant complex to protect from environmental damage and a skin-firming peptide complex to boost and maintain skin’s elasticity. The serum does include Palmitoyl Oligopeptide and Palmitoyl Tetrapeptide, two very effective anti-aging ingredients. Unfortunately, the peptides are the two LAST ingredients in a lengthy list of 31 ingredients. This means there are only enough peptides to allow Boots to list them which makes you wonder about the overall effectiveness. All in all, it feels silky on the skin and seems to work as well as many pricier serums. Only time will tell. Worth a try in my opinion. Boots No7 is available at Target, QVC, Ulta, Walgreens, and Beauty.com. In Canada you can find them at Shoppers Drug Mart & London Drugs – priced between $20 and $40. It can also be purchased online through Boots USA. I haven’t tried any of their other products – have you? Any comments? A great all around basic. It doesn’t get cooler than wearing a simple white T-shirt and most people own at least a few of these closet classics. Not only is the T endlessly versatile and effortlessly wearable, but it also happens to be super comfy and available at every possible price point. Let your tee stand in for your go-to button-up the next time you wear a pantsuit. Knot the hem of your tee for an abbreviated top with major throwback appeal. There’s nothing wrong with wearing Hanes but if you’re looking for something more luxe, then The Row’s got a tissue-thin version you’re guaranteed to love but it will set you back a few hundred. They’re useful all year long. In winter wear one as a layering piece under something like a flannel shirt which you can remove if it gets too warm. Dial down the formality of a precious jacket—beaded, fringe-trimmed or otherwise embellished—with your casual tee. 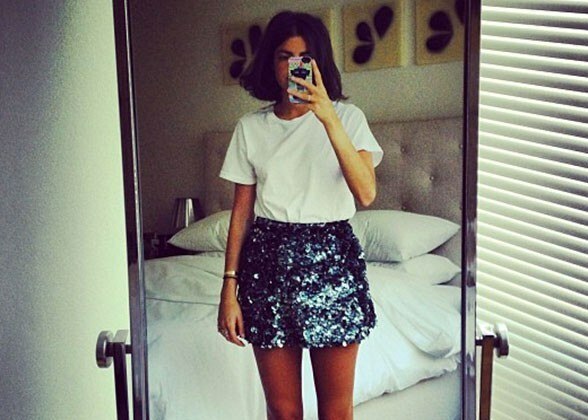 When paired with a tucked-in white tee, sequins suddenly feel far more wearable. Now that it’s officially spring—and with summer on the horizon­—the white tee is more important than ever. It’s the perfect complement to your favorite cutoffs, sure, but it can also anchor a playful print or be repurposed as an of-the-moment crop top. Looking for some fun, fresh ways to wear your favorite white T-shirt this season? Here are some T-based looks that are sure to inspire you! So they’re not really lollipops, but the term “tomato skewers” sounded too mundane. Summer screams of BBQ and we’re constantly heating up our grill to cook up whatever flavors epitomize the season. Because these tomatoes are so cute and plump, it sounds more appropriate (and fun) to call them lollipops especially when you jab them onto sticks. 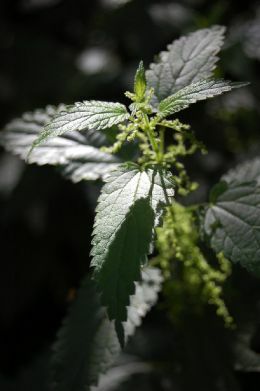 Plus, they taste sweet like candy during this time of the year. 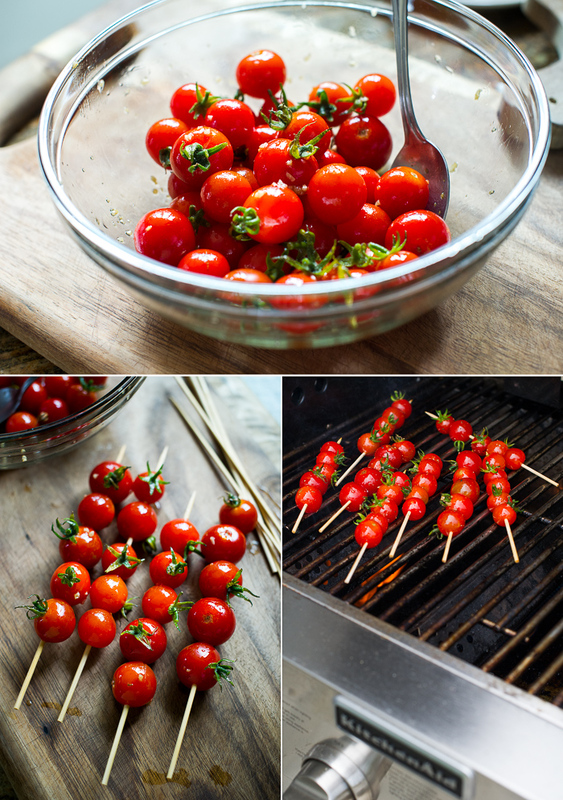 Have you ever grilled your cherry tomatoes? They’re super amazing and the texture is like roasted tomatoes, but you don’t have to turn on your hot oven in the Summer. And best of all, they have the wonderful bbq flavor to them. Before grilling place them in a bowl & gently mix with sea salt and a little olive oil & balsamic. 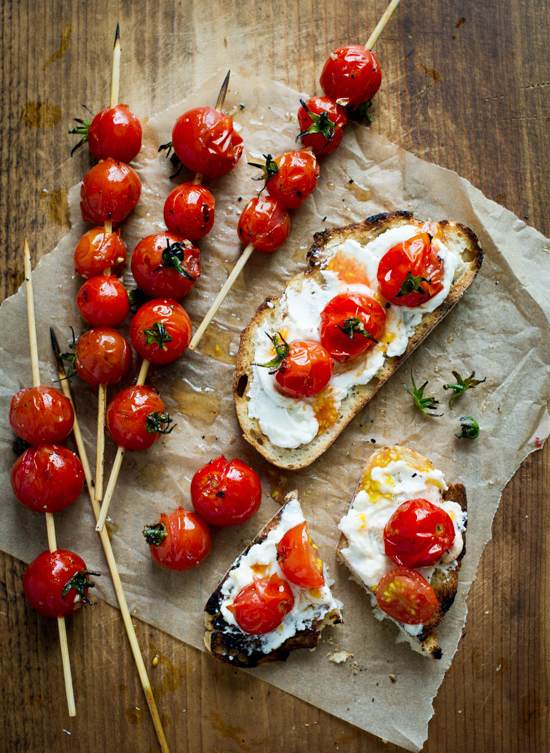 A simple way to enjoy these grilled tomato skewer “lollipops” is on grilled bread swiped with a nice layer of ricotta cheese. 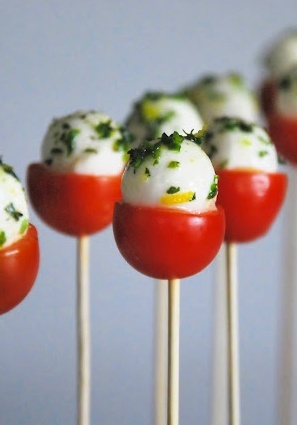 Make sure to make a big platter of these little skewer lollipops for your gathering because they’re sure to be a hit. They’re so good, your guests will probably eat them right off the skewers just like candy. Or; freshly hollow them out & place rounded baby mozzarella inside dipped in olive oil & cilantro or parsley. Skewer on individual sticks for a lovely and tasty presentation. taken from “white on rice” couple. Design, Art, Travel, Shopping – these are some of my favourite things! 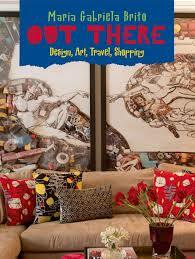 Maria Gabriela Brito is an art collector and interior designer living in New York City and the author of Out There: Design, Art, Travel, Shopping ($60USD – Pointed Leaf Press). The book is an insider’s guide to designing interiors and developing an art collection. OUT THERE is a fresh and exclusive look behind the scenes of a passionate and exciting new design authority on mixing contemporary art with home decoration. It features highlights of Brito’s favorite contemporary artists, photographs of eight New York City apartments that she designed, and an extensive look at favorite galleries, shops, and hotels worldwide. The following is taken from her interview by Danielle Pergament for Allure Magazine. Rather than trying to match art to your furniture or throw pillows, look for work that you love but that is on the edge of your comfort zone in terms of brightness. Color is the fastest way to bring life to a room. Go BIG. The bigger the piece, the more it will transform a room. Don’t shy away from a large piece. People tend to choose art that is too small for the space. 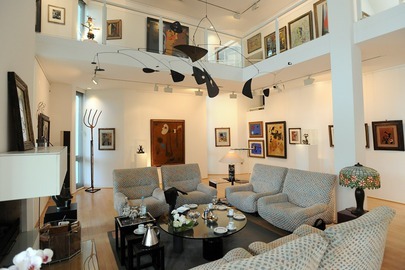 Take your cue from the furniture your art will hang near. If your sofa is 70 inches long, go for a piece that’s 50 inches: if the couch is 96 inches long, try something that measures 80 inches. If you can’t find one really big image you like, you can cheat by placing two side by side. The bottom of the frame should sit six to ten inches above the top of the furniture, and the closer the top edge is to the ceiling, the higher your ceilings will look. Present it Properly. If you’re buying art from a gallery, follow their framing or mounting suggestions, which usually reflects the artist’s wishes. As a general rule, stretched canvases don’t need a frame, and large photographs look best mounted in acrylic or Plexiglas. If the colors of the artwork are muted, consider a colorful frame to liven it up. Advance your Placement. Before you automatically hang a new piece in the living room, think about your entire home. Instead of the predictable console and mirror in a foyer, imagine a huge, vibrant print/painting there. I especially love to incorporate smaller pieces of art in unexpected places, like a bathroom or kitchen. In the bedroom, go a bit more subdued – black-and-white photography, for example – to keep the room peaceful. How to hang a gallery wall. Hallways make great mini galleries, but it can be tricky to hang lots of pieces of varying sizes. Here’s how to do it: take a piece of butcher paper the size of the wall (or tape paper panels together) and put it on the floor. Arrange all the artwork you want to hang on the paper. You can play around until it really looks right, then use a pencil to mark exactly where each should go. Tape the paper to the wall and hang each piece on its designated mark. Finally, rip the paper carefully. Voilà – your own gallery. Health MATTERS: Let’s go NUTS! 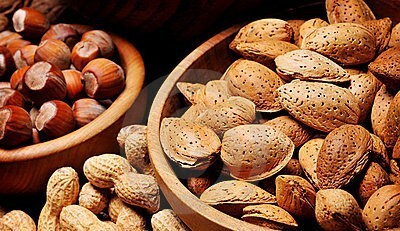 Call them the skinny nuts. In a 2013 study in the European Journal of Clinical Nutrition, people who ate about one and a half servings of almonds with breakfast felt a significant decrease in appetite. When the nuts were consumed as an afternoon snack, they quashed appetites by about two and a half times that, helping subjects naturally eat less for the rest of the day. Serving Size: 23 nuts, 164 calories. A study in the Journal of Nutrition found that people who consumed about three servings of pecans experienced as much as a 33 percent drop in oxidized LDL cholesterol (the kind that causes artery-clogging plaque to form). The pecan’s power may lie in its high levels of heart-protecting antioxidants. Serving Size: 19 halves, 196 calories. Not only are pistachios the lowest-calorie nut of the bunch, but they’re also rich in healthy unsaturated fatty acids. In a study, a group that consumed 20 percent of their daily calories from pistachios for nearly six months had lower blood sugar and cholesterol levels – two risk factors for heart disease – and trimmed their waistlines more than those who ate a wholesome but pistachio free- diet. Great news – I love pistachios! Serving Size: 49 nuts, 159 calories. These pack roughly 21 grams of fat per serving, but most of it is the unsaturated kind. Macadamia nuts are an excellent source of two nutrients vital for healthy brain and nerve function: manganese (one serving delivers 65 percent of what you need daily) and the B vitamin thiamine (30 percent of your recommended dietary allowance). Serving Size: 10-12 nuts, 204 calories. First the bad news: you can’t eat a lot of them. Each of these Amazonian nuts contains about 33 calories – the equivalent of nearly 10 M&M’s. Now the good news: You needn’t go overboard to reap their health benefits. 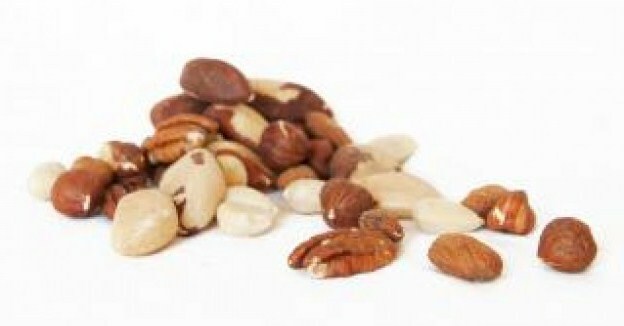 Just two nuts per day for 12 weeks can increase blood levels of the mineral selenium by 64 percent. Selenium is essential for proper immune function, as it helps build germ-fighting white blood cells. Serving Size: 6 nuts, 186 calories. This goes to prove that true STYLE HAS NO AGE. 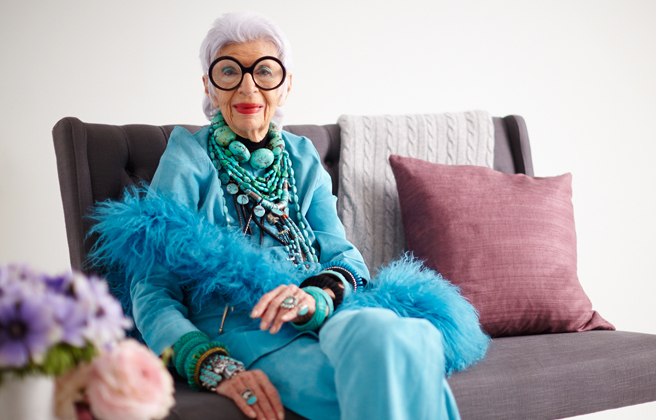 I admire Iris Apfel – she’s the real American Idol! Most “it” girls fade into obscurity well before their first wrinkle but Iris found fame in her mid-80’s, when the Metropolitan Museum of Art’s Costume Institute mounted a show in her honor. The almost 93 year-old (her birthday is in August) who just recently learned how to use the internet, answered a few questions for Allure magazine about retaining style in her tenth decade. Can you remember your first major purchase? Do you agree with the adage that before you leave the house, you should look in the mirror and remove one accessory? The Huffington Post has this to say: Iris Apfel is one of the most stylish, unique, energetic people you’ll ever meet in your life. While many of us go around in a fog of “What will people think?”-type thoughts regarding everything from clothes to decor choices, Apfel surrounds herself with what makes her happy. That’s it. Now that’s someone worth admiring. Born Iris Barrel in Astoria, Queens, New York. Apfel is the only child of Samuel Barrel, whose family owned a glass-and-mirror business, and his Russian-born wife, Sadye, who owned a fashion boutique. Apfel studied art history at New York University and attended art school at the University of Wisconsin.. As a young woman, Apfel worked for Women’s Wear Daily and for interior designer Elinor Johnson. She also was an assistant to illustrator Robert Goodman.